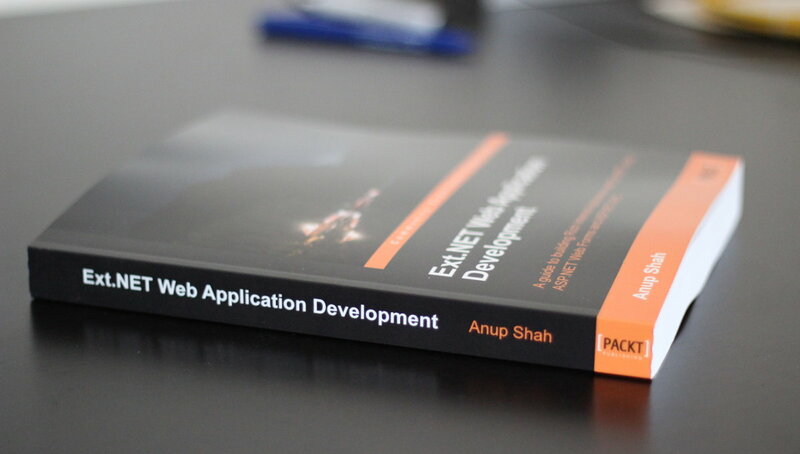 My book, Ext.NET Web Application Development has just been published by Packt Publishing. The reviewers were none other than the Ext.NET team itself. They were excited about and dedicated to this book which would not have amounted to much without their involvement. They are also offering free copies with any purchases of Ext.NET! The publisher is offering these discounts until 31st December 2012. Update December 4, 2012: I’ve just published a post on the Ext.NET web site describing the book in further detail, including a summary of all the chapters, sample screenshots, and more. The chapter overviews are below, but see the previous post for further info too. Chapter 1, Getting Started with Ext.NET, provides an overview of what Ext.NET is and how it is related to Ext JS and ASP.NET. In addition, this chapter covers how you can obtain and set up your development environment ready for Ext.NET development. Chapter 2, Ext.NET Controls Overview, introduces various types of controls available in Ext.NET. Using the Button control, we introduce many concepts common throughout the Ext.NET control suite. We also look at how client-side and server-side events can be set up. This chapter also introduces other more common components including Panels, Toolbars, Menus, Windows, and Tooltips. We also get a glimpse of some of the complex UIs that are possible by reusing these components. 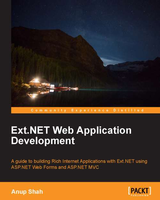 Chapter 3, Layout with Ext.NET, covers the numerous layout options available in Ext.NET to help you organize your web applications. Topics covered include the Viewport, and specific layouts such as Border, Accordion, Fit, HBox, VBox, and more. Chapter 4, AJAX with Ext.NET, looks at the powerful AJAX options Ext.NET supports. We cover the powerful DirectEvents and DirectMethods features, as well as AJAX options specific to certain controls. This is a powerful chapter that lays the foundation for slick and usable applications that are responsive to user interactions. Chapter 5, Working with Data, looks at the powerful data handling techniques available in Ext.NET. We cover XTemplates, which allows you to define HTML templates to bind data to, and we explain the Stores, Models, and Proxies architecture that allows for powerful data-binding reuse across many Ext.NET components. The ComboBox and DataView are introduced as examples of controls that reuse this architecture. Chapter 6, Introducing GridPanels, covers the popular and highly sophisticated GridPanel control. It is another control that reuses the Stores, Models, and Proxies architecture, but is given its own chapter. We look at various features of the GridPanel such as paging, filtering, sorting, grouping, column summaries, row expanding, and selection models. We also look at how grid editing can be enabled, including in-line grid editing at the row or cell level. As large as this chapter is, there are many other GridPanel capabilities that we have not been able to fit into this book, so many links to further examples and resources are also provided. 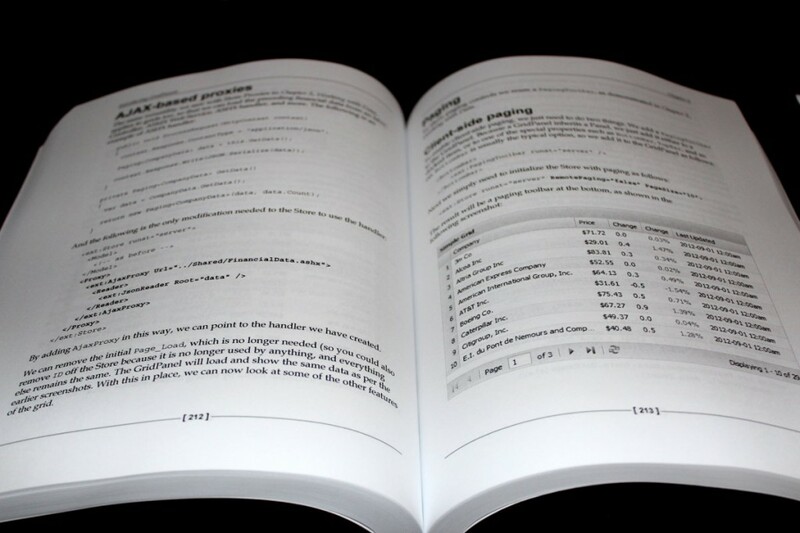 Chapter 7, Forms and Validation, looks at the numerous form controls available in Ext. NET, how to lay them out, and how to enable client and remote validation. We also look at how custom validators can be created. Lastly, we also see how Ext.NET’s data-binding capabilities can also be reused with forms. Chapter 8, Trees and Tabs with Ext.NET, introduces the popular TreePanel and TabPanel controls. Due to limited space in the book, we cannot cover all the sophisticated possibilities that these controls offer, but we do provide an overview of how tree nodes can be loaded asynchronously and how to reuse the Store, Models, and Proxies architecture to bind data to trees. We also look at various ways TabPanels can be configured, including how to load content on-demand using various AJAX techniques supported by Ext.NET. 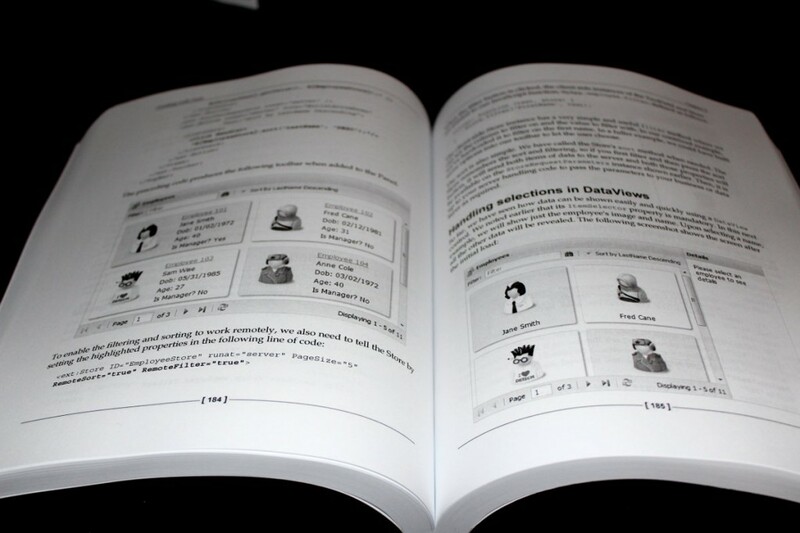 Chapter 9, Extending Ext.NET Controls – Custom Controls and Plugins, is perhaps the most powerful chapter in this book. It shows you how to extend Ext.NET controls in a variety of ways to support both ASP.NET Web Forms and ASP.NET MVC Razor templates, enabling you to create highly reusable components. Most of the chapter looks at how controls can be extended, but we also look at how you can use the available plugin mechanisms to reuse functionality across different types of components. My personal favorite is chapter 9. Not only did I learn a lot myself when putting it together, I think it is also one of the most important; I wish I knew this about 3 or 4 years ago as it would have helped make my own apps even more reusable. For me it is worth getting the book for this chapter alone! The book on my desk! Ext.NET and Ext JS cover this really well and saves a lot of time trying to create a sophisticated widget framework letting you concentrate on improving your application with highly reusable components. With Ext.NET’s important enhancements and integration with .NET it is a compelling choice for these types of applications. So around January 2012, when Packt asked me if I wanted to write a book on Ext.NET, despite having no spare time, it was hard to resist! I started around March or April, and had it not been for some some major personal interruptions in between, it might have finished around August. But the release times nicely with the Ext.NET 2.1 release. It has been a great learning experience for me and I would have certainly liked to know some of the things mentioned in there when I first started out learning Ext.NET! It would be great to see another post explaining the process that went through making this book. Yeah, good point. One day I will write something about it! @Peter! Thanks… I just read a few minutes ago from the publisher that I may be able to offer the book at a discounted rate (details still to come). I apologize if you have lost out, but perhaps email me and we can try to sort that out somehow. Update: Just added chapter overviews and some photos of the book as I just received the paperback copy in the post a couple of days ago.